After 9 months of research, applications, letters requesting permission, buying and building the chicken coop, painting and setting it up, buying supplies of tonic and medicine as well as food grit and straw . . . what is still missing? Chickens! 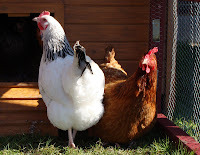 On Monday 1st of March we drove to Smilers Farm to pick up the girls and here they are:Belle the Bluebell, Big Bertha a Rhode Island Red, Gwen (Guinevere) Sussex White and Esmerelda, Black Comet. We spent most of day enjoy the first of crisp bright spring sunshine and watching them wonder around our garden. They have settled in happily although the first Bluebell had to go back to the farm because she was sick, they can care for her needs much better than us, we are not experienced enough to know what is best for her. Bertha is the eldest so I expect the first eggs to come from her in a couple of weeks time, and then Gwen who is 2nd eldest, the other girls will follow a few weeks at a time after her. Yummy fresh eggs, I can't wait! i cant believe u have chickens!! are they loud at work they make this almost laughing sound most of the day, though it is fun to herd them around! !